Steal dancing is when you are dancing with your partner and a 3rd person amicably “cuts in” for fun. This game is different than a typical social dance: it becomes less about patterns and musicality and more about flow and transitions. But it should not be entered into blindly. Like in any game, you should have an orientation to the playground before you’re allowed to play. There is quite a bit of technique required in order to maintain flow and manage momentum. – we teach this in our Steals Workshop at select events. But if you’re going to try experimenting with it on your own before you have a chance to attend a workshop, there are rules and expectations you need to know so everyone involved can be safe and have fun. Don’t just steal randomly. Instead, jockey like we do in a jam circle: Make eye contact with both partners before jumping in, and wait for approval: if they return your eye contact and don’t look concerned about you jockeying, it’s probably ok.
Don’t assume that you have permission to switch roles. If you steal someone who is leading (you replace their follower), you should expect to become the new follower. Don’t steal a leader then force them to follow. If you see a steal group in progress, don’t assume you are invited: it’s probably a private party, so just enjoy observing. Be hyper aware if someone is dancing with a Champion/guest Pro – you don’t want to interrupt their chance to have a full 3 minutes with that rare partner. Consider your partner’s level and stealing skills. Don’t give them any reason to be afraid of you or lose their trust in you. Stealing doesn’t mean grabbing. The more abrupt the transition, the more dangerous and inappropriate it is. Pay attention to the dancers’ positions and travel to make sure you are choosing a convenient time and opportunity to cut in. It’s not a battle or a game of keep-away – don’t be combative or aggressive: this puts your partners at risk. Don’t ever force a transition. When in doubt, yield. If you are trying to help out a rookie thief, keep your patterns simple and predictable to make it easy for them to jump in. As the active follower, reach out and connect with the free leader to facilitate the transition. Technique is not optional: you need good connection skills in order to play this game. There are fundamental techniques required to manage momentum and make transitions more safe, comfortable, and creative. Seek them out in a workshop or private lesson. Keep it simple when you are first learning how to steal – look for easily accessible transitions. Avoid urgently grabbing the hand to cut in: use other available body parts or connect on the arm above the handhold. The transitions should be so seamless that if the stolen partner’s eyes were closed, they would have a hard time detecting the difference. There is no need to impress the follower with fancy moves. Flow and adaption is the game; musicality and patterns take a back seat. Let go of your pattern and footwork math and stay flexible and adaptable. Stick Together! If you were having a conversation with a few people at a dinner party, you would try to stay focused on them and wrap it up before starting a new conversation with someone else. The same rules apply. Think of it as a single social dance song shared amongst a small group, not a free-for-all. Stay with the same 2-3 partners for the whole song. Steal dances are different from Jam Circles. (Definition of Jam Circle: one couple is featured at a time, and after 1-2 phrases, a new couple takes over.) In the case of a birthday jam, every few phrases a new partner will cut in to steal the birthday person. This should feel like a wedding reception line where many different people get to take a turn honouring the birthday person with a segment of dancing. Steal dancing should be just as civilized, but only involve the same 3-4 people who then “rotate” jumping in. If you would like to intentionally organize a “stealing jam circle” with more than 3-4 people, all parties should abide by stealing rules, starting with Consent. Once you have been replaced, don’t wander off. It’s easy to feel left out and awkward, but your partners are fully expecting you to stick around and participate, so you need to take the initiative to cut back in. 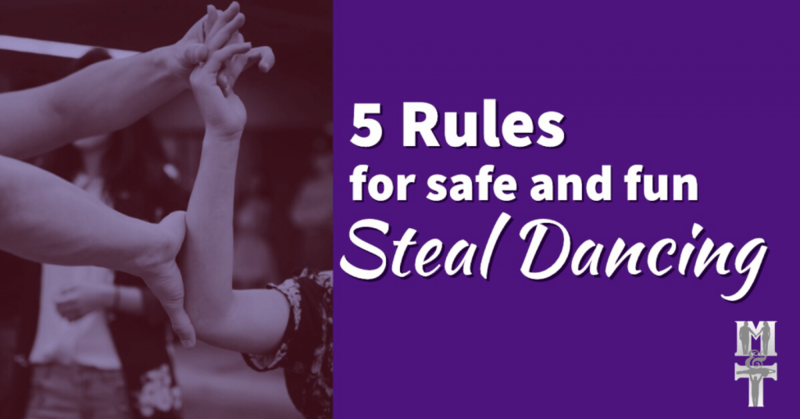 We recommend sharing this video and article in your Westie community FB groups so everyone can learn the etiquette and expectations to learn how to enjoy safe steal dancing! Like I said, technique is not optional and there is an art and a science to this game of flow between partners. For more info on how to have us run a stealing workshop at your event, contact us for details. We have at long last taken the very successful Swing Literacy Teacher Development Program and created a version just for dancers! Get nerdy with your West Coast Swing – start today!